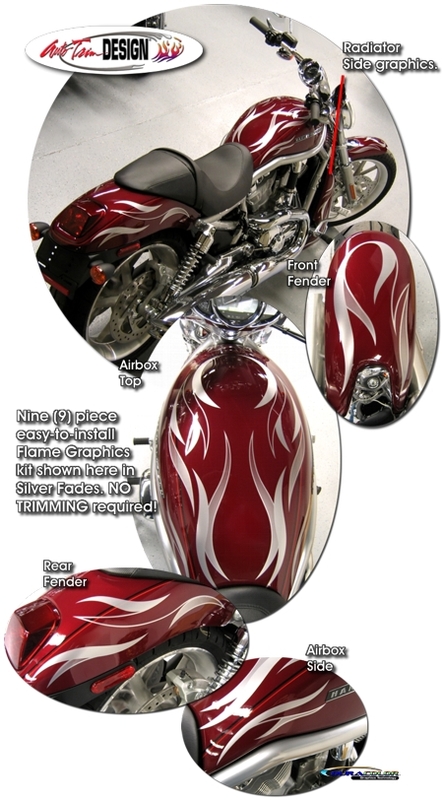 Set your V-Rod from the rest with this "Hot" Faded Flames Graphic kit, made specifically for the areas as shown. Available in eight (8) different fade colors, this precut easy-to-install graphic kit features traditional and reverse flames that uniquely fade from solid to a light fade as shown - they look so good, they look factory! While this kit is made specifically for the Harley-Davidson V-Rod, Night Rod or Street Rod, it may also be used on a wide range of other bike applications. Be creative - "Mix & Match" - use some flames and save the rest - this kit is very versatile! The nine (9) piece kit requires NO TRIMMING and includes easy-to-follow general online instructions. Dress up your bike today!